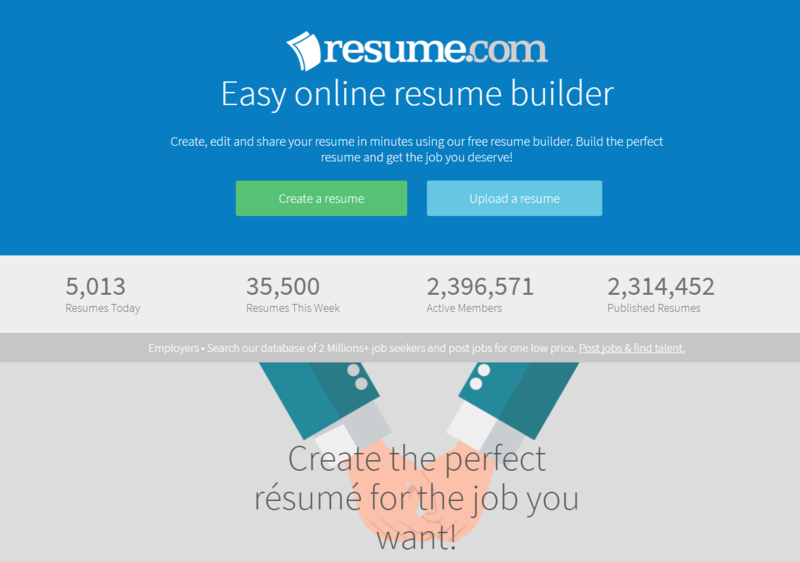 With over 2 million published resumes and thousands of orders every day, Resume.com is a widely popular service that offers assistance with your job applications. In addition to this, the website of the service is one of the most professional we have seen, offering all information we needed for our Resume.com review. However, no service is perfect without a good list of services, solid pricing, and of course, high product quality. Let’s see if this is a good company for you. 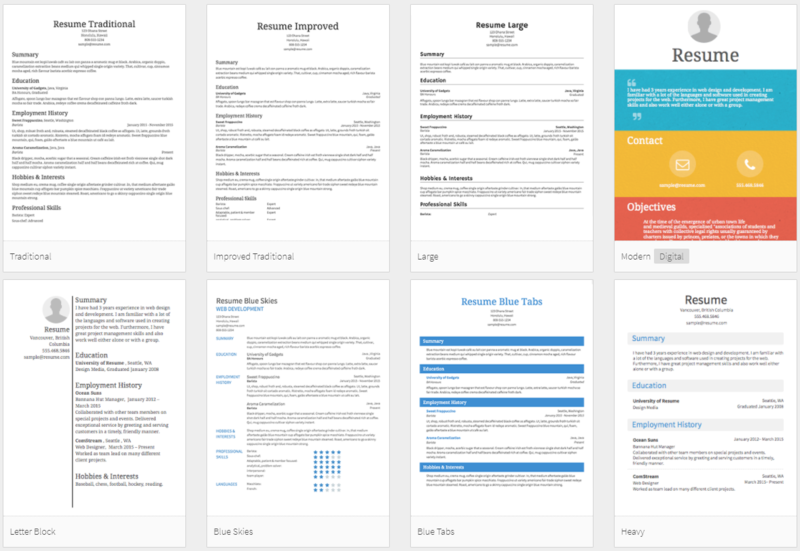 This is not your regular resume writing service. The company works on a different approach – they create various templates and provide you with the opportunity to create your own resume at an affordable price.Generally speaking, the range of services here is focused on one product only, and that resumes. But, the types of resumes and formats are so varied, that makes this company the number one service in terms of resume options. Even though they fail to provide other job application products, the fact that you can create all kinds of resumes here is a big advantage. In addition to creating a brand new resume, you can upload your existing resume and make some necessary changes to optimize your chances of getting called for an interview. And most importantly, the company allows you to publish your resume in multiple version, as well share it within minutes. The pricing of your resume will depend greatly on the template you choose. Still, even if you choose the highest price option, you will find that the service is actually very cheap. According to Resume.com reviews, we found online, this is the cheapest company they have seen.Of course, the prices are much cheaper since basically, you are the one doing the job. This company does not hire experts that work on your resume but hires experts that create templates and an easy resume-creation process for you to use at an affordable fee. Therefore, if you were looking for a more affordable option, this may just be the service you need. As for discounts, there aren’t any. You cannot really get a discount since the prices are based on the template you choose. Of course, you can choose a resume creation option that best fits your budget. We cannot really speak of the quality of this company’s services, since they don’t actually write your resumes for you. However, they made the resume creation process very easy, which made us reconsider ordering a custom-made resume altogether. After all, even if you want someone to write your resume, you have to provide them with all qualifications and details they need to include in it. This company’s creation process works on exactly that principle – you use a template and add this information, after which the website arranges it and formats it on its own. There are no available guarantees on the website, aside from the privacy guarantee. If you think about it, there isn’t really a revision or refund guarantee they could offer, since you are the one crafting the resume. However, the privacy guarantee is a great advantage, since you can be certain that they won’t use your resume and information for any reason. The only way to get in touch with Resume.com is through their contacting form, but this form is actually very effective. We got a response in our e-mail within an hour, which is a fast turnaround for such companies. In addition, the customer service agent was very friendly and pointed out to the many helpful tips and articles you can read on the website to help you with the resume creation process. Resume.com is a legit service that works on a somewhat different principle from the traditional resume writing services. Instead of creating the resume for you, the company allows you to choose a template and only add the information you need, after which they provide you with an affordable, easy to share a version of your own customized resume. Their list of services is a bit limited, but this still makes for a solid choice of a resume provider. Of course, that is if you are willing to do the task yourself. I ordered a small package from resume.com and received it before the deadline, but I am not too happy with the service. The price is good and the resume is a good fit for the price, so no complaint there. Still, not the best company I’ve used. They do have some flaws, but the company is not that bad. I share all the same opinions with the writer of this Resume com review. It’s not the best company, but it is definitely not a bad one. Hello, Liza. Thanks for sharing the experience! Do not pay for this. I repeat…DO NOT SUBSCIBE…it is a waste of money, no help, and frustrating. DO NOT PAY FOR THIS…it is a scam. Simple entry, then BOOM…THEY WANT MORE MONEY! Do not….do not go to or pay for this waste of money! Trust me, I went there. DO NOT SUBSCRIBE OR BELIEVE ANY OF THEIR LIES!